Since the timing of the MRSP protocol at least with the ZTUUF0 test program is critical, the Windows emulator does not work realiably. Possible problems are timing delays due to the FIFOs of the modern serial interfaces, time delays with USB-to-serial converters and/or delays if multiple programs or tasks are running on the PC at the same time. This program is free software; you can redistribute it and/or modify it under the terms of the GNU General Public License as published by the Free Software Foundation version 2 of the License (http://www.gnu.org/licenses/gpl.txt). This program is distributed in the hope that it will be useful, but WITHOUT ANY WARRANTY; without even the implied warranty of MERCHANTABILITY or FITNESS FOR A PARTICULAR PURPOSE. See the GNU General Public License for more details. Please send improvements to me. Enter to exit setup menu. According to Will Kranz, disk image files larger than the 256k of the TU58 cartrige can be used with the emulator. When used with the dd.sys and ddx.sys device drivers, do not use the squeeze and init commands, since they do not work properly with disk images > 256kBytes (>512 blocks). He foud out however, a method to modify block size of the dd driver and made a dw.sys driver for rl (10 mByte) disk images. The block size is strored at hexadecimal offset 0x2c and 0x2d. To modify the driver you can use a hex editor to chage the value on 0x2c and 0x2d. I created device drivers for 10mByte rl compatible (dl:) and 32mByte mscp compatible (du:) disk images. To use the drivers mount the TU58-dv-and-dw-drivers.dsk file using the TU58 emulator, cop the drivers to the system disk, e.g., use the "copy /sys dd0:d*.sys dl:" command, and reboot the system. If you boot rt11xm you before using the driver you have to load the driver with the load command, e.g., "load dd:". The driver can be unloaded with the unload command. Do not load two or three TU58 drivers at the same time (dd, dv or dw)! 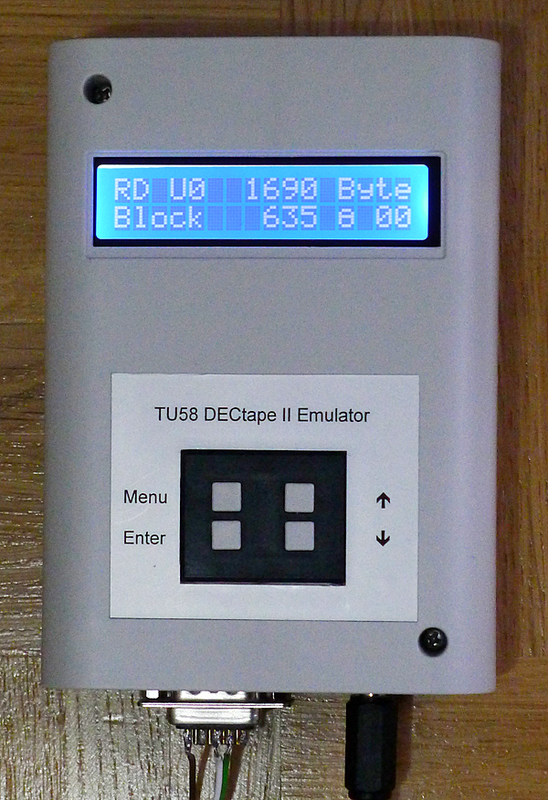 Select TU58-90.dsk using the buttons as disk image0, and TU58-91.dsk as disk image1. We will use disk image0 to boot XXDP, disk image1 will be used as a test drive, any data on this tape will be overwritten! The Radial Serial Protocol (RSP) specitic code was tested with RT11 V4.0 and 5.3 running on a PDP11/23, PDP11/53 and on different simulated PDP11s on Ersatz 11 (E11). 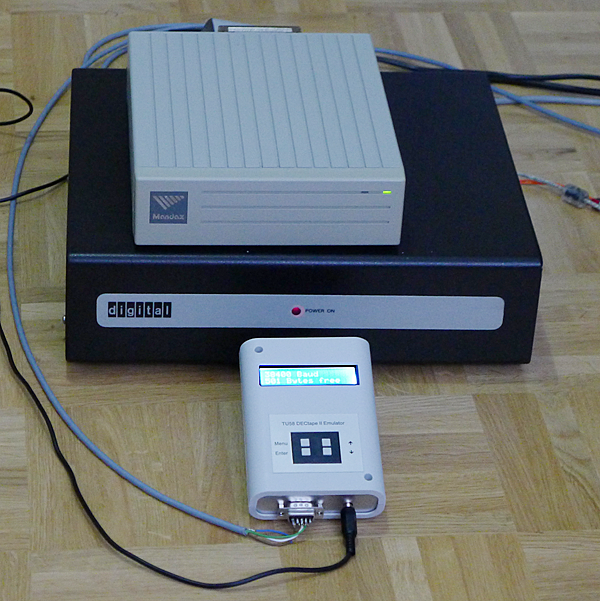 The Modified Radial Serial Protocol (MRSP) was tested with the XXDP ZTUUF0 test program. 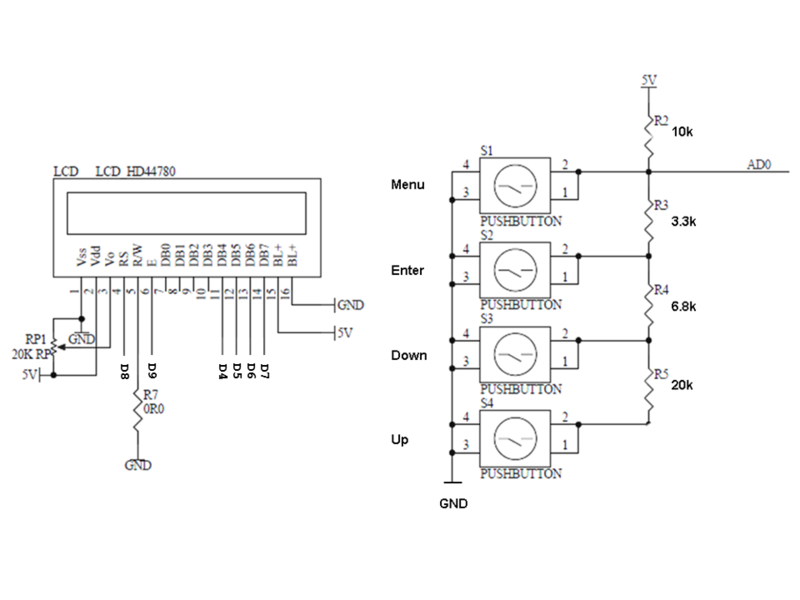 Display & keyboard - circuit diagram. TU58 connected to a PDP11/23. 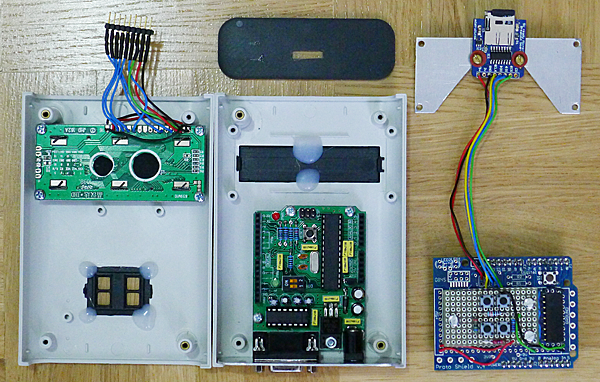 Development system with Arduino Mega1280, with the LCD shield, SD breakout board with active 5 to 3.3 V level shifter and a TTL-to-RS232 interface. Arduino Leonardo without LCD. 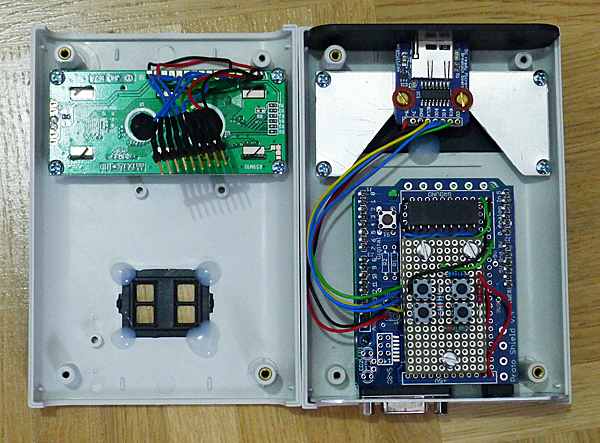 Menu settings and activity monitoring are implemented usig serial emulation via USB interface. The virtual serial port is connected to a VT100 compatible terminal emulator (Settings: 115200 Baud, 8 bit, no parity, one stop bit). 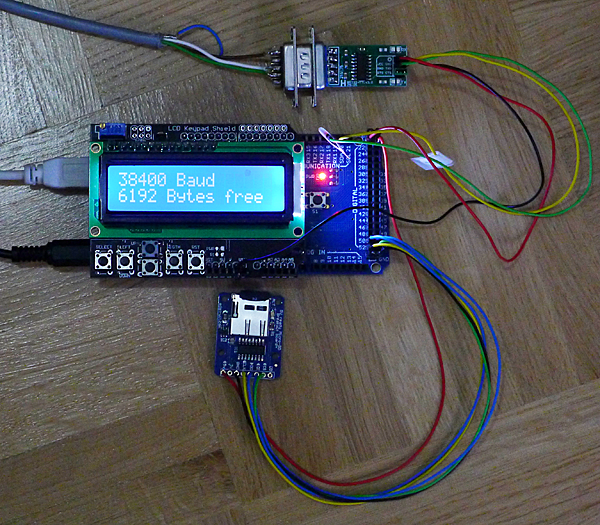 A TTL-to-RS232 interface should be attached to the TX and RX lines. 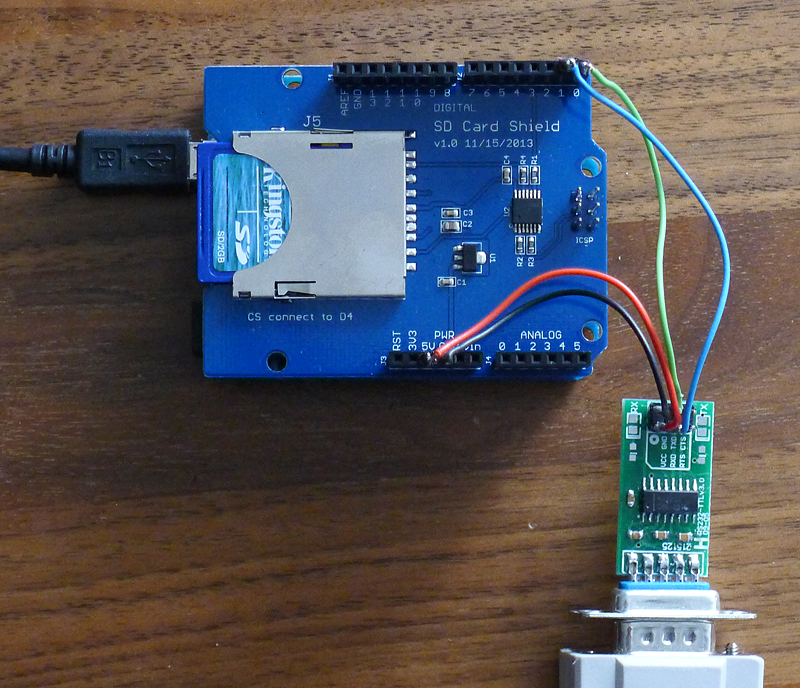 Arduino Mega1280 or Mega 2560 can also be used this way. Monitoring TU58 atcivity using the serial interface, connected to a VT100 compatible terminal emulator (putty). Menu settings using the serial interface, connected to a VT100 compatible terminal emulator (putty). 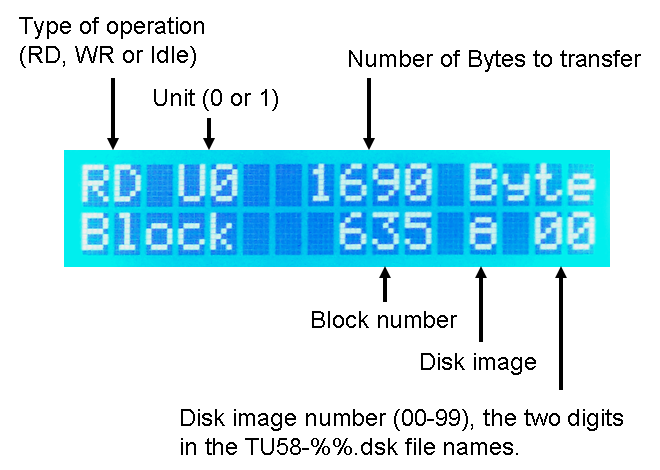 SD card connections are documented in the header of the tu58.ino file.